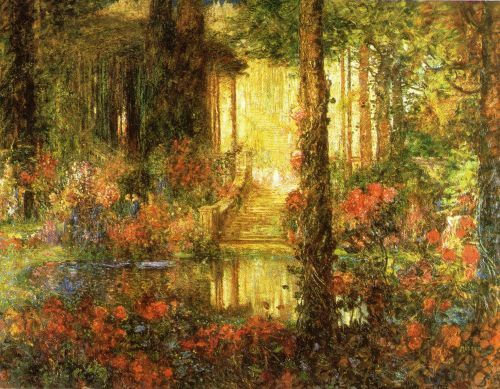 Left: Design for act 2 by Thomas Edwin Mostyn, 1914. © Bradford Art Galleries and Museums. ound of weapons. From outside, the threatening voice of Parzival. Kundry disappears. "To work!" Klingsor springs up on to the wall: he watches the fight between Parzival and the bewitched knights. Klingsor laughs at their loutish jealousy as they defend the way to their beloved she-devils: he delights as they are defeated by Parzival and killed or forced to flee. His gaze follows Parzival now striding, childishly proud, through the open gate, now turning towards the garden. "Ah, childish offspring! Be summoned for what you will: you are still too stupid and you are forfeit to me. Here, eternal Lord of the Grail, you will come to a sweet end." - He vanishes. Left: Flower Maiden costume by Paul von Joukowsky, Bayreuth 1882. © Richard- Wagner- Gedenkstätte. arzival has entered Klingsor's wonderful, magic garden: his astonishment at the unspeakable charm is mingled with an uneasy combination of alarm, hesitation and horror. But he is not to compose himself: from various directions, singly, beautiful women rush in, their hastily-donned clothing disordered, their hair dishevelled, etc. They have heard sounds of fighting: waking, they have found themselves abandoned by their lovers: some have run to the battlements, seen the flight and reported to the other women that their lovers have been fought with, put to flight, even cut down by the bold stranger. Lamentation and imprecations: they rush at Parzival. heir threats, reproaches, lamentations are pacified at the sight of the hero and the realisation of how handsome, child-like and artless he is. Some mock him, others invite him to make reparations for their lost lovers: soon he is being flattered and petted. Amazed, but quite artless, Parzival abandons himself to what he takes to be a childish game without any thought of there being something serious behind it. Soon jealousy and argument flare up among the women: some. having withdrawn into arbours, now return with hair charmingly adorned and in daintily ordered attire; they are scorned by the others, but imitated. The coquettish play for Parzival's favour degenerates into quarrelling and wrangling. Parzival still responds as if to childish play: refuses to understand anything and treats nothing seriously. Now they deride him: their scolding and mockery make him almost angry: he is about to flee. 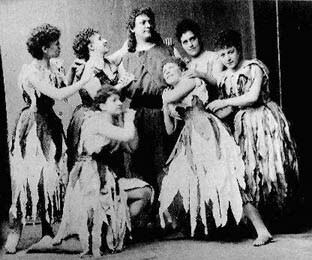 Right: Hermann Winkelmann as Parsifal, with the Flower Maidens, in the 1882 Bayreuth production. ©Richard- Wagner- Gedenkstätte. hen he hears the loud, loving sound of a woman's voice calling him by his name. He stops, shaken, believing it to be his mother, and stands, greatly affected, rooted to the spot. The voice admonishes Parzival to stay: here he will experience great happiness: she orders the women to leave the youth alone; he is for none of them: their lovers have been preserved: they would like to return; and urges them to be at peace. Hesitatingly, the women obey: dejectedly they leave Parzival, each secretly preferring him to her own lover: gently and flatteringly they leave him and go separate ways. Parzival, now sure that he is dreaming, gazes timidly to see where the voice has come from. Then, in a grotto, upon a couch of flowers, he sees a young woman of the greatest beauty; Kundry, in new, quite unrecognisable form. Still standing far off, he asks in amazement if it was she who called him. 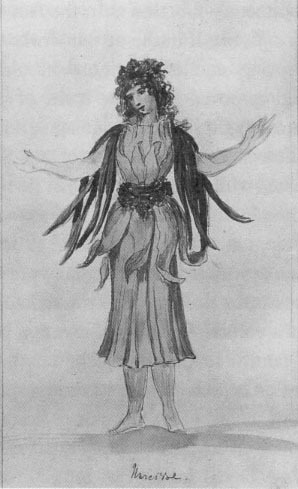 Edith Clever as Kundry and Michael Kutter as Parsifal in H.J. Syberberg's film. ©Artifical Eye. undry: Did he not know that she had long awaited him here? What then brought him here, if not the wish to find her? Parzival, wondrously attracted, approaches the grotto. His emotions are mingled with vast unease; his earlier, cheerful artlessness deserts him and in its place a deep seriousness falls upon him, a vague feeling that a momentous decision will soon be required of him. The wonderful woman knows how to play upon the tenderest chords of his emotion by touching intimately and solemnly upon his childhood memories: evening, morning, night - the complaints and fond embraces of his mother; the longing of that distant, forsaken woman for her son, her languishing despair and death. 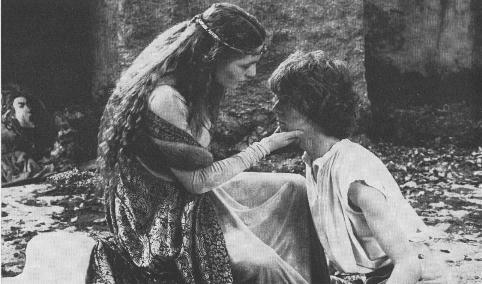 Parzival, overcome by fearful emotion and overwhelming melancholy, sinks weeping at the feet of this beautiful woman: he is tormented by dreadful remorse. ending over him, she puts her arms around his neck. Soothing and chiding of his immoderate grief. Not all that could make him happy was contained in his mother's love: the last breath of motherly longing is the benediction of the first kiss of love. Bending her head above his, she now presses her lips to his in a long kiss.